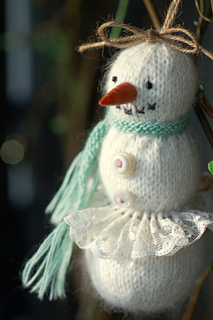 This cute little snow woman (or snowman) is knit from the bottom up in one piece with no seaming. 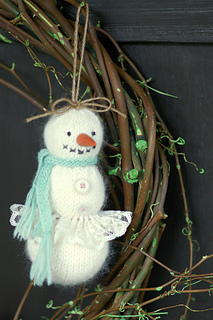 She’s perfect for using up your yarn scraps that I know you have laying around. She/he can be decorated and adorned with whatever your little heart desires. 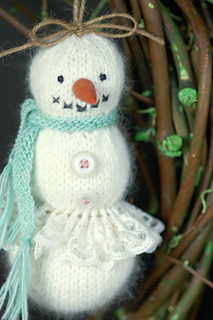 I have included notes on how I decorated my miss snow with the mini scarf, ruffle skirt, vintage buttons, and embroidered face. In addition to the size and gauge listed, I think that miss snow could be knit up in a variety of sizes just by changing the weight and needle size you are using. 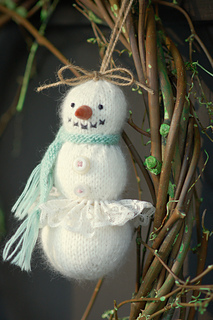 Remember that when knitting a toy/ornament like this, you want the gauge to be tight so the filling material does not poke through the knitted fabric. How sweet would a little snow ball family be?! This free pattern has not been test knit or edited, so please be so kind to send me an email (yarnonthehouse@gmail.com) if you find any errors or have any questions. Enjoy!